Franklin Cyrus Banks was the youngest in a family of six children. It is said that in infancy he was rather frail and delicate, so much so that his mother had to carry him on a pillow. His lack of physical vigor seemed to remain with him until early manhood. At the age of twenty-two he weighed only 127 pounds, a weight below standard for one of his height which was five feet and six inches. From this time on he became much stouter until at the prime of life and thereafter his average weight was between 170 and 175 pounds. In complexion he was blonde of a very pronounced type, having rather large deep blue eyes, a very fair skin and light hair. During a portion of his manhood he wore a full beard but usually he was clean shaven with the exception of a mustache. In disposition he was exceedingly jovial and a general favorite among all his acquaintances. He was universally recognized as an expert story teller and his jokes have become proverbial. He was very frank and out-spoken in expressing his ideas, a little dogmatic, it may be said, and set in his views but a thorough hater of all that savors of hypocrisy or deceit. He had a deep religious nature but was unwilling to accept doctrines which did not conform to reason. He was not a blind believer, but one whose faith was unshaken in the sound principles of the Gospel. Facts that could be reasoned out were far more acceptable to him than those accepted by some upon simple faith. One of the most enviable traits in his character was his contentment with his lot. It is not to be understood that this contentment bordered in the least upon indolence. To the contrary, his whole life was one of intense activity. Even in old age he was not content in idleness. He took supreme satisfaction in his home and surroundings, never longed for money or wealth beyond enough to live in simple comfort. Due to his thrift, frugality, and industry, he was able to rear and educate a large family and to lay aside a sufficient amount to maintain himself and wife in ease during their declining years. F. C. Banks was the son of John and Ellen Edmundson Kendall Banks. In company with his mother and father and sister, Merab, the other four children having died, he set sail for America. Arriving at New Orleans on March 8, 1850, the family immediately made its way north and westward arriving in Salt Lake City in the early fall of that same year. 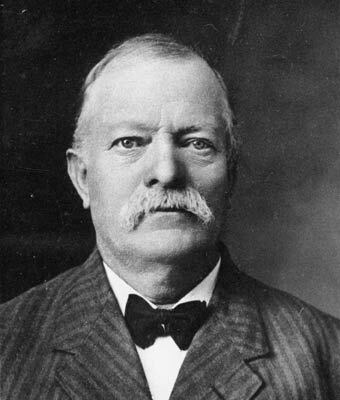 After a brief stay in the pioneer city, the family moved to Pleasant Grove, Utah, thus becoming with William H. Adams one of the two first families to settle that community. On this point, however, there is some controversy, others claiming this distinction. Franklin's boyhood and youth were full of pioneer experiences building the fort wall, clearing ground for farms, planting, cultivating, harvesting crops in truly pioneer fashion attending the village school three months each winter. It is regrettable that his home life during this period was somewhat one sided. He lacked the association of his father who was seldom home for many days together. John Banks was not the type of man to be satisfied with the simple but arduous life of a pioneer farmers and so his stays with his little family in Pleasant Grove were more in the form of "visits" than anything else so that Franklin was left almost wholly to the company and teaching of his mother. She practiced the good old English method of training children and although Frank was compelled frequently to "give over" his will was never broken but merely directed along proper lines. Some valuable training came to Frank by Joseph Davis whom his mother married in 1857. Unfortunately, Davis did not live long, less than a year following the marriage. Frank was left once more with no guidance even from a stepfather until his mother married William Green in 1866. By this time Franklin was of such an age that he was able to hire out among the farmers of the town and so earn his own living. Arrived at manhood's estate in age if not in stature, Franklin acceptedwork freighting out on the Promintory, hauling supplies to the construction company building the Union Pacific railroad during the winter of 1868-69. The money earned at this time and through the following summer must have been for a wedding stake for on Decamber 6th 1869, Franklin married Eliza Luff Crossland in the old Endowment House, Daniel H. Wells performing the ceremony at Salt Lake City. Upon the date just mentioned began what proved to be a long and happy partnership. The parties to this union were quite different in many respects but very much alike in those that tend toward a happy and contented home life. Fortunately happiness to this couple did not depend upon wealth. Frugality and thrift were always found there and although the luxuries were wanting, the actual necessities of life were always provided for the young and growing family, many years passed before the luxuries might conscientiously be engaged in. Indeed it was not until the marriage of most of the eight children that the parents could relax in any considerable degree their efforts to wrest from nature a subsistence and begin to enjoy a little well earned ease. Whatever of privation or hardship that may have been undergone was endured cheerfully and courageously. Associations with friends and neighbors were always cordial and tended to break the monotony of toil. Such simple entertainments as home dramatics, concerts, and house parties were freely indulged in during the winter months. Pioneer square dances were a major source of entertainment, each couple paying admission with grain, potatoes, eggs, butter, or some other item of produce and taking a candle along to help with the lighting. If no shoes were to be had, bare feet were in order. The first home of the family was at Pleasant Grove in a little house across the street south from the Grove or city park. Here five children were born viz., Nettie, Edna, Frank, Ellen, and Violet. Although the home was in Pleasant Grove proper, the farm was in the "Basin" two miles south east of town. In the fall of 1879, the family moved out upon the farm much to the consternation of neighbors in town. Here was born three additional members of the family, John, Junius, and Karl. After all the children were reared and Karl alone left unmarried, tile farm was sold and a home made in Pleasant Grove once more. This last move took place in 1909. The new home, a four room house with bath, pantry etc. was built on what was known as the old John Long corner, one block east of the present (1948) high school. Money obtained from the sale of the farm and other savings were loaned to provide an income. In addition Frank obtained odd jobs to augment their resources so that there was plenty for a comfortable living. 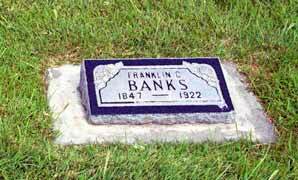 Religiously, F. C. Banks was a true Latter-day Saint. He was a strict observer of the law of tithing, Word of Wisdom, family prayer, Sabbath Day and other church requirements and taught the same to his family. He was honest and truthful to the uttermost. His word could be absolutely relied upon. He was free-hearted and generous contributing liberally to those in need. Each of his sons received an education beyond the elementary schools or a cash or land gift of equal value His activity in the church began when he was a boy. He acted for many years an "deacon" for the meeting house in Pleasant Grove, making fires, sweeping and dusting, blowing the conch shell for the beginning of church gatherings. He filled a two year mission in the Southern States mission, engaged in Sunday School work for 30 years, was a block teacher for 45 years, President of the YMMIA., headed Religion class work in ward and stake for a number of years, served as a stake missionary, president of the 44th quorum of Seventy, was chairman of the building committee for Lindon Ward Chapel and filled many other appointments. He was a natural born teacher and had wonderful talent in explaining and making clear gospel principles. He enjoyed nothing better. In a secular way he served a term on the City Council in Pleasant Grove and two terms on the Board of Health. Socially he was a friend to everyone. No one could pass his place if he was out that did not receive a pleasant greeting. He was loved and respected by all who knew him. In the early spring of 1919 calamity came to F. C. Banks. He was taken with a severe paralytic stroke which affected his entire right side both leg and arm. His speech and other mental faculties were also affected. He regained the ability to talk, although his walking was not normal, but he enjoyed but little use of his arm thereafter. This affliction was a great trial to him. He had scarcely been sick a day in his life and then suddenly to become helpless and not able to continue his regular activities but to be waited upon by others was almost more than he could take. He had always taken great satisfaction in talking and joking with all about him, and now to be almost speechless was a terrible blow. His speech improved some but he was never able to speak freely again. On the 5th of August 1922, J. G. McDonald invited Frank and his wife to visit with him at his summer home at Brighton in Big Cottonwood Canyon. A very enjoyable evening was spent with music, singing, jokes and refreshments. After retiring to bed Frank suffered another severe stroke. He was hurried to his home the next day. The family was called and he passed away Sunday evening, August 6, 1922.